The Reloop Beatpad is a dedicated iOS controller, developed and optimized for the popular iOS app DJAY by Algoriddim, offering a totally new and unimagined mixing experience with your iPhone, iPod or iPad. The Beatpad utilises the app’s full potential with numerous control elements, such as dedicated filters per channel, push encoders for effects and loops, as well as an extensive and multi-functional drum pad section with performance mode. The controller is compatible with iPad (iOS 6 or higher). It charges your device using the included 30-pin and 8-pin Lightning Adaptors and (via USB) can also be used as a high-quality MIDI controller for your Mac or PC DJ software of choice, for example DJAY for Mac or Traktor. The appearance of the Beatpad benefits from Reloop’s many years of developing professional DJ controllers. With the recognisable high-grade aluminum Trax Encoder, you can comfortably browse through your iTunes playlists while the illuminated XXL jog wheels with their diameter of 15cm and vinyl grip surface cry out for you to perform extensive scratching sessions. 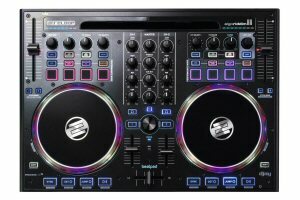 The multi-colored LED jog wheel borders give the user visual feedback regarding the virtual needle position and current effect and loop modulations and the 100mm pitchfaders make manual beatmatching a walk in the park. The Beatpad’s performance section offers numerous, creative mixing possibilities: you can set up to 4 hot cue points per deck, while bounce loop mode allows you to cut the loaded track into single loop sequences on the fly. In instant FX mode the 4 drum pads offer the ability to trigger macro effects at the push of a button. In order to accomodate and trigger single samples in a playing mix, you can use the sampler which turns the performance mode section into a full blown DJ sampler. Despite these numerous creative tools, the performance mode always remains clear, also thanks to the multi-colored RGB LEDs and their various mode colors. Connections are also well thought out with two headphone connections on the front side, two master outputs (XLR, RCA) and even an aux input for iPod, CD player or turntable on the back of the device.